The red and green cherries make these bars perfect for the holiday season. 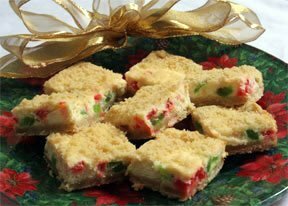 They are sweet and delicious bars that make a nice addition to your tray of holiday sweets. They will be a favorite amongst family and friends at your holiday gatherings. Watch how to make sweet and crunchy peanut brittle for your holiday celebrations. Thinking of hosting a cookie swap? See tips on how to organize and plan for a successful event.